For centuries, our ancestors were accumulating knowledge about the world and nature. 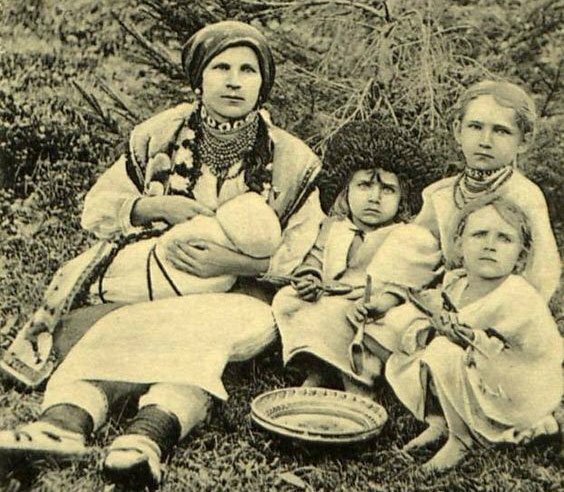 This knowledge formed the basis of the economic and household culture of Ukrainian people, which includes a whole range of traditions, customs, rites and rational practices that ensure the continuity of community life and reproducibility of the population in certain climatic conditions. 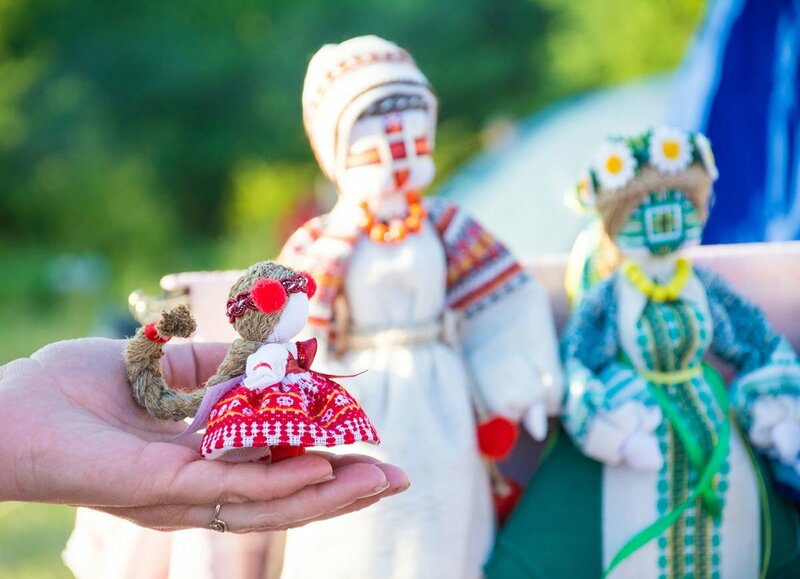 The economy of Ukrainians was based on the traditional agricultural complex, which included grain farming as the main industry, associated with it cattle breeding and auxiliary activities - various crafts. Features of household activities defined the nature of life of people which found expression in public traditions, in appearance and utensils of traditional dwellings, in food habits, features of clothes and so forth. Since ancient times, people have been closely watching the surrounding world and the phenomena of nature. These observations formed into a system of knowledge about the universe. So, knowledge about weather phenomena took shape of the system of folk meteorology; knowledge about animals and plants – of folk zoology and botany; observations of the heavenly bodies took shape of folk astronomy. Weather prediction played an important role in economic activity, it sometimes influenced good yields and working conditions. Ukrainians predicted the weather by observing celestial bodies, atmospheric phenomena, plants and behavior of animals. In particular, they knew that if there was the morning dew there would be fine weather, if a rainbow appeared in the sky it would not rain, if the smoke piped up it was an indication for the good weather, but if it happened in winter it would be bitterly cold. People predicted weather during major calendar holidays. For example, people believed that what the weather was like for the Annunciation, the same weather would be for the Easter. Or if on the Forty Saints Day there was frost in the morning, they were expecting “forty frosty days more”. Agriculture was the main type of economic activity of Ukrainians, and, as scientists prove, since the days of Kyivan Rus it was of highly developed arable nature. Ukrainians used few utensils of tillage: plow, scratch plough, sokha. Grain crops (mainly rye and wheat) in Ukraine were sown twice a year: in autumn (fall-seeded) and in spring (spring-seeded). Ancient utensils for harvesting included sickle and scythe. Serrated sickle was used to harvest rye, barley and wheat until the 1920s. Harvested crops were usually knitted into sheaves, which were then dried in haycocks and half-haycocks. Next, the grain was cleaned of straw, using a chain. The grain was stored in the closets and the hallways. The whole cycle of agricultural work was accompanied by rituals and actions that, according to the peasants, had to contribute to a good harvest. You walked all summer on the field. And you got a headache, and a backache." 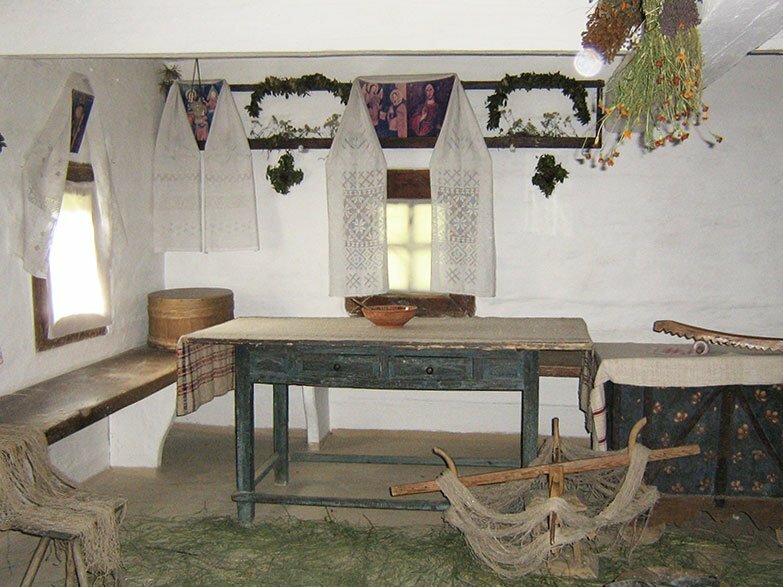 In addition, other branches of agriculture were developed in Ukraine, first of all - horticulture, grassland, gardening. The latter was mainly of household character. Such vegetables as cabbage, carrots, turnips and cucumbers were grown. Gardening in all regions was of the household nature, however, the monasteries and estates of the landlords had much larger gardens. Cattle breeding occupied an important place in the economy of Ukrainians. In each yard peasants kept horses, oxen, cows, pigs, and poultry. The animals were kept in the units, barns or stables. In summer cattle was grazed, and, for the winter, people harvested hay and other types of forages. Different breeds of livestock adapted to local climatic conditions were popular in different regions. 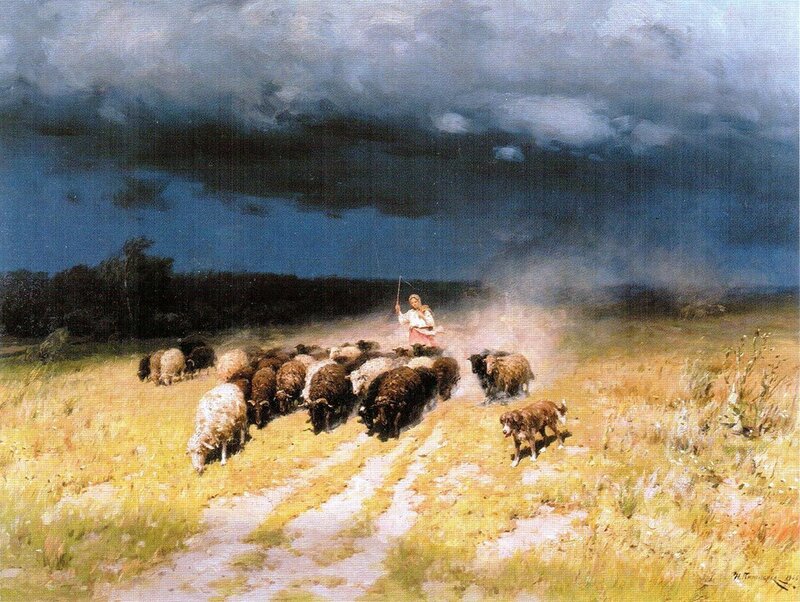 Thus, in most central areas of the forest steppe meat and milk gray Ukrainian breeds of cows were bred. In the Carpathian region small and unpretentious "rashka" or old Hutsul breed of cows was widespread. The owners took good care of animal hygiene, knew the basics of veterinary care and protection of livestock from diseases. Folk architecture is a branch of culture that combines rational knowledge and skills in the field of construction, as well as the traditions and beliefs of the people associated with housing and human settlement. Construction materials depended on natural and climatic conditions. 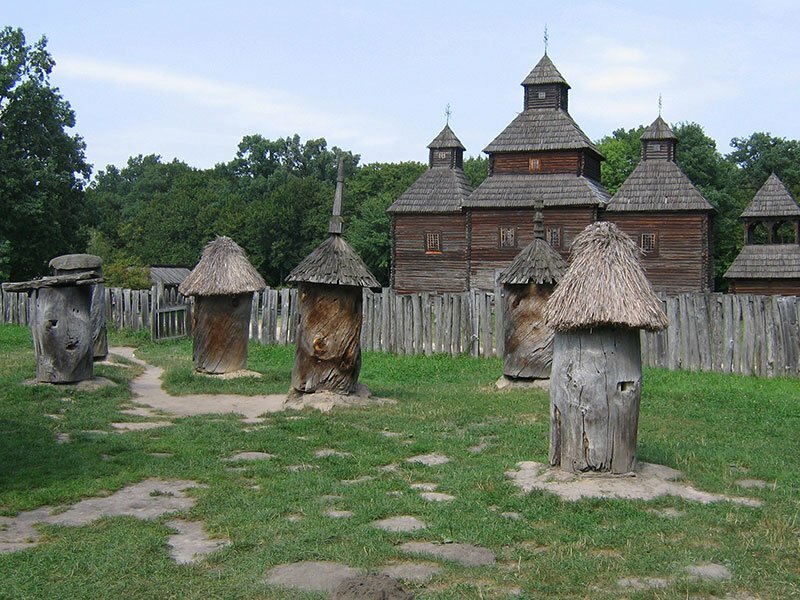 If in the North of Ukraine people usually built dwellings of wood (logs), in the Central and Southern parts of the country (forest steppe and steppe zones) the usual material was clay. 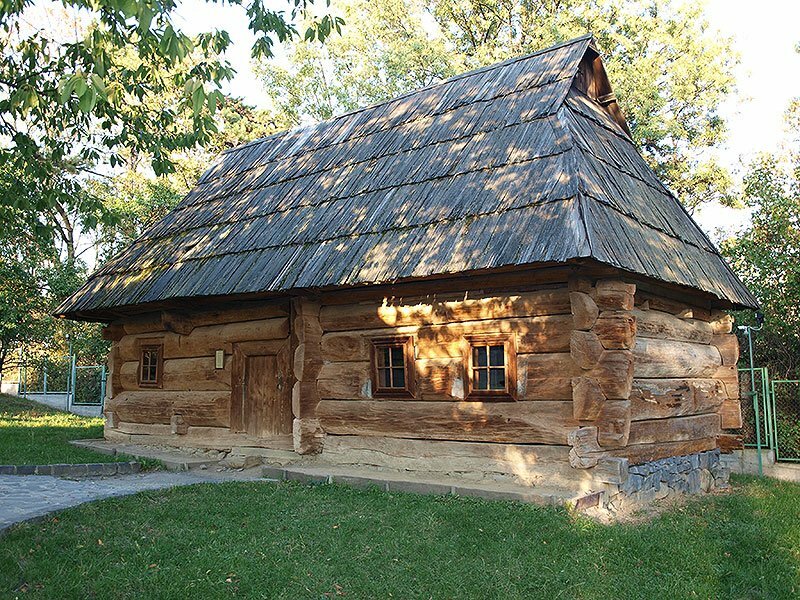 Roofing material for most territories was straw, in the Carpathian mountains and some areas of woodland, people used wood (shingle) for this. Classic Ukrainian huts were quite simple in their layout. Already in the first half of the XIX century two-chamber dwellings (hut + hall) were common and at the end of the century-three-chamber (hut + hall + pantry) were common. Inside the house there were some simple pieces of furniture and utensils necessary for the life of the family. The center of the interior of the house was the furnace for cooking, diagonally across from the furnace there was a front corner (God's corner), a table and benches stood under it. The family slept on wooden platforms and on the furnace. All the tools necessary for daily work were kept in the hallways and in the pantry. Except for the house, in the country yard there were other constructions of household: a well, a stable for cattle, an outside pantry, a shed for storage of grain. Usually the buildings in the yard were located chaotically, but in some regions there was a tradition to build all the buildings in one row (Boykivshchyna, Lemkivshchyna, Polissia) and along the perimeter, in particular, it was popular among Hutsul people. 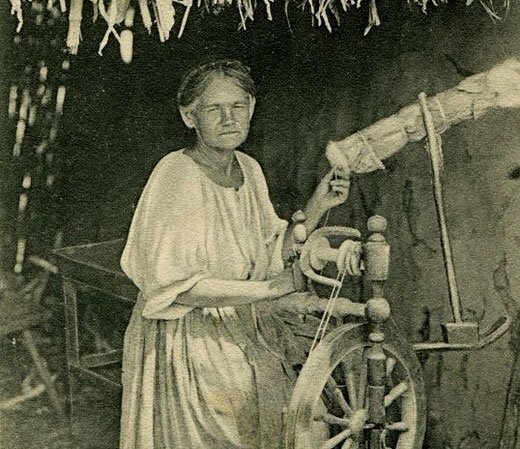 Before the formation of modern medicine, folk healers were the unique carriers of traditional special knowledge, practices and beliefs in the field of medicine, diseases and the human body in the villages and towns. They healed patients with medicines made from natural materials: minerals, plant and animal products. 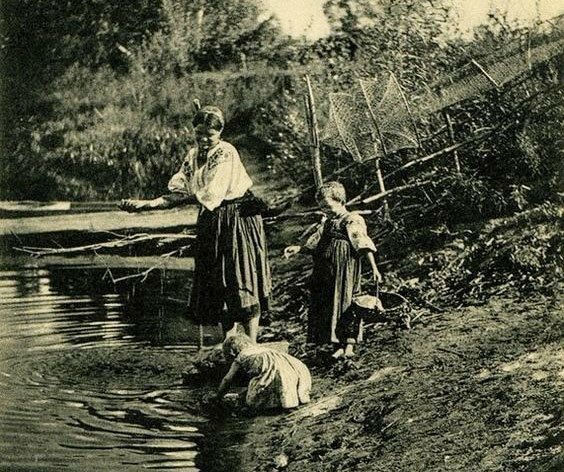 Medical potion more often was harvested the day before or on the Ivan Kupala Day. 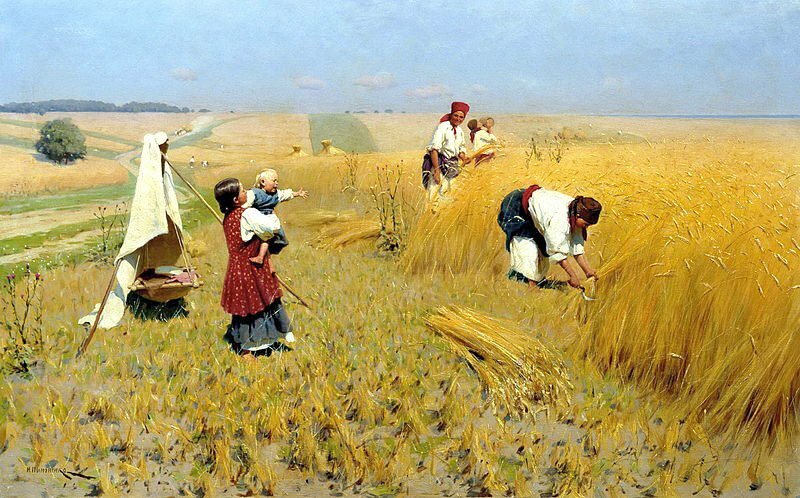 A good day for harvesting of grass was considered to be May 10 – the feast of Symon Zylot (Zlotnyk). Popular medicinal herbs included calamus, St. John's wort, henbane, melissa and the like. It was believed that the disease occurred due to violations of the prohibitions, due to bad forces or rational circumstances. Ukrainians knew such diseases as "cold", "jinx", "stroke" "black disease" and erysipelas. In addition to the medicines, magical rituals and prayers were required in the treatment process. They were performed by healers, whisperers, midwives, who lived in every village. Such people were considered "knowledgeable", that is those having knowledge and skills beyond the reach of mere mortals. It was believed that the prayers and the prescription of medicines from various diseases could not be performed by random people, otherwise, all medicines would lose their healing properties. Before dying, the healers tried to pass on their knowledge to a heir (mainly someone from relatives). If this did not happen, it was believed that such a person would die in throes. The game was an important way of socialization and mastering the necessary skills of adult life. That is why traditional children's games often combined elements of group interaction and various logical exercises. There were motor games ("catch","cat and mouse"), games with objects ("baker", etc), and role-playing improvisational games (for example, "huts"). There were also games directly related to calendar rituals and economic activities. 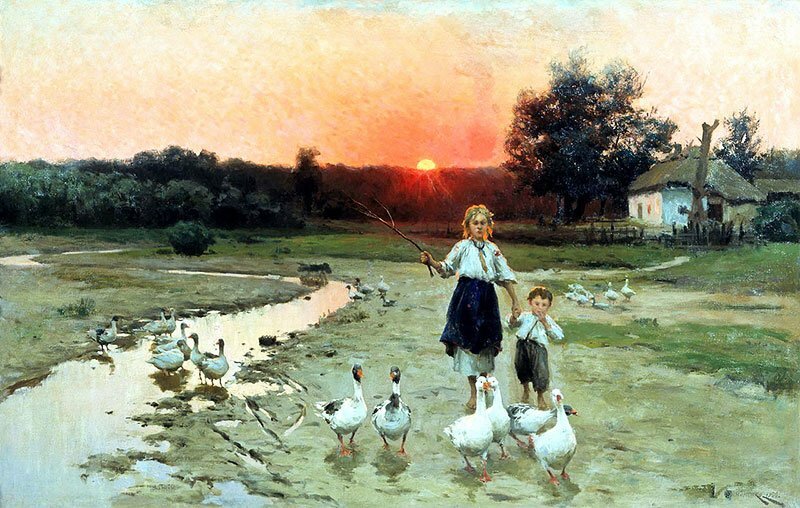 In the XIX century there were not enough toys comparing to the modern time. 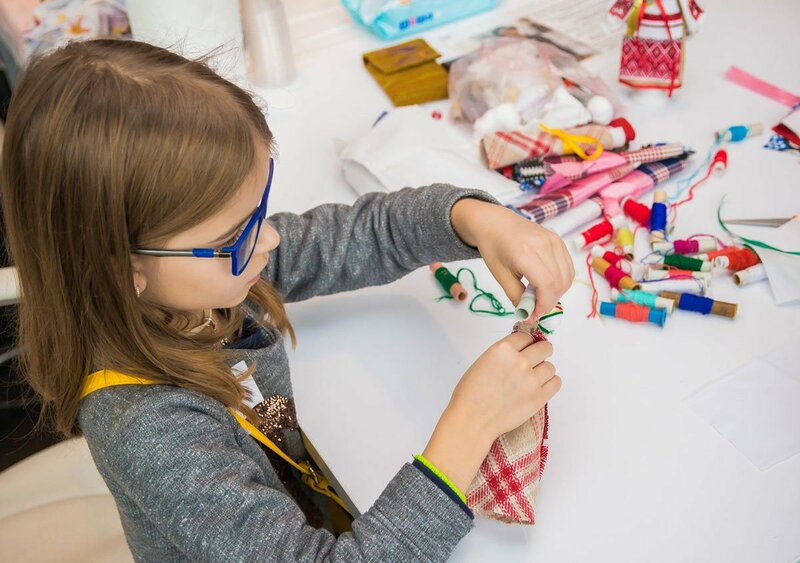 In the game, children used ordinary household and natural objects and materials, sometimes adapted to the needs of the game: sticks, stones, pieces of cloth. This way a rag doll which is well-known today appeared: for its creation people took pruning of old clothes, shawls and other clothes and made a toy out of them. Such a toy mimicked a doll-baby or a girl. In addition to the game function, the dolls also had an apotrope (magic, protective) function. So, in Podillia region, there was the custom to hang up two cradles in the house. In one, people put the baby, and in another - a doll. It was believed that then the devil would grab the doll, not the child. Children's games transferred elements of the cultural heritage of the people from generation to generation, at the same time they were constantly changing under the influence of time. Ukrainian ethnology: textbook / Under the scientific editorship of Borisenko. K.: Lybid, 2007. 400 p.
Hlushko M. History of folk culture of Ukrainians. Textbook. Lviv, 2014. 416 p.
Sapura O. Folk arts and crafts of Ukraine = Ukrainian folk arts and crafts /[Sapura O. V.; edited by: Munin, et al.]. Kyiv: Press distribution Agency, 2015. 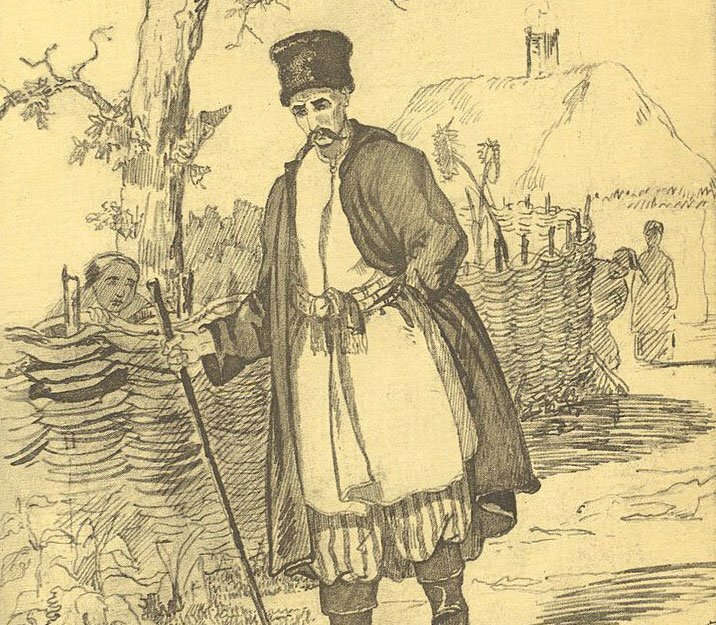 253 p.
Lazurenko V. From genus to genus: the public life of Ukrainian peasantry in the second half of the XIX century / V. M. Lazurenko, S. S. Krokhmal. Cherkassy: Vash Dim, 2004. 91 p.